But I need to make a decision about how the leather-covered versions will look. And I am going to ask the people who have already ordered copies of said versions, but I thought I would also throw open the question for others — particularly if you think that at some point you would like to order one of these (or the same kind of binding for St. Cybi’s Well when that is done). It largely comes down to how the books are sewn together. The cloth-bound edition is sewn on tapes (as seen in the images in this post). I can put the same binding into a leather cover without a problem. Or I can sew the books onto cords (as seen in this entry on my professional site). I don’t mind a little extra work — which would be the case for the raised-cord bindings — but wonder whether the aesthetic is out-of-step with a modern work of science fiction. Edited to add: The two different leather bindings shown just demonstrate the differences between the structures on the spine of the books. In each case, the overall design was determined by *that* project. The final design for my books will be different — and related in theme to each book in a way I think is appropriate. Who are the Martians, now? Very soon the U.S. Military will be fitting some of their fighter jets with real laser weapons. The U.S. Defense Advanced Research Projects Agency (DARPA) says that the new laser system will be fitted onto jet aircraft in 2014 as a defensive weapon capable of knocking out missiles and other projectiles while in flight. If you’ve been waiting for the future to finally get here, just go ahead and mark your calendar for 2014. It was recently announced that the U.S. Defense Advanced Research Projects Agency (DARPA) would be retrofitting some U.S. military jets with actual 150KW lasers that will be able to knock missiles out of the sky. The new laser weapons are part of DARPA’s High Energy Liquid Laser Area Defense System and are purportedly being fitted as a defensive measure specifically for knocking projectiles out of the sky such as surface-to-air missiles or any type of larger projectile. The exact specifics of the system’s capability are still classified. I stood staring, not as yet realizing that this was death leaping from man to man in that little distant crowd. All I felt was that it was something very strange. An almost noiseless and blinding flash of light, and a man fell head-long and lay still; and as the unseen shaft of heat passed over them, pine-trees burst into fire, and every dry furze-bush became with one dull thud a mass of flames. And far away towards Knaphill I saw the flashes of trees and hedges and wooden buildings suddenly set alight. It was sweeping round swiftly and steadily, this flaming death, this invisible, inevitable sword of heat. Small wonder that I’ve had this song kicking around in my head, from what is probably a largely-forgotten concept album 35 years old. Lots of fictional characters have Twitter accounts — usually, one created by a fan to have a little fun. Well, the idea* occurred to me today to set up an account for Darnell Sidwell, who is the main character of St. Cybi’s Well. If you’ve read Communion of Dreams (and if you haven’t, why not? I mean, seriously, go read the damned thing.) you know Darnell as the crusty old prospector with a colorful history. St. Cybi’s Well is the start of his story (OK, not really — he’s already middle-aged — but for our purposes it is), and you get to meet a man who is 40 years younger with a lot of changes ahead of him. Personally, I love the character, even if I’m going to put him through hell in this book. Anyway. St. Cybi’s Well is not being written from Darnell’s perspective. Rather, like Communion of Dreams, it is written from a third-person narrator’s perspective. But the Tweets are going to come directly from Darnell, from his perspective. He’ll be writing about his thoughts and experiences as the story of St. Cybi’s Well unfolds. Sometimes there will be hints about the story. Sometimes he’ll give away some insights. Sometimes he’ll (unintentionally) mislead, because he won’t understand exactly what is going on in the bigger picture. This will be fun — and somewhat useful for me, since it is always a good thing for a writer to completely get inside the head of a character, to understand how they view the world. To a certain degree I go through this exercise with any major character, but this will be a way I can share some of that process. When all is said and done, it will form something of a supplement to the novel, and I’ll probably figure out a way to have those Tweets collected/linked in the final version. In the meantime, you can ‘follow’ him @DarnellSidwell, and we’ll put up batches of Tweets on the St. Cybi’s Well site. He’ll probably Tweet every day or two, as my schedule allows. Now I need to get back to work. Toodles! *Credit where it is due: this idea came to me when reading today’s Girls With Slingshots strip — note the ‘hover text’. I haven’t been doing a lot of blogging the last couple of weeks. Partially, that was due to my having actually come down with the actual flu — and getting that shortly after I had finally gotten rid of the last vestiges of the previous illness really sorta sucked my energy level down. But there was another reason: I’ve been writing St. Cybi’s Well. See, I’m using Scrivener. Which I like a lot, but which is completely different from my previous work habits in writing a book. In an odd way, it’s more comprehensive, more systematic. I’m still learning how to use it, and it is taking some fumbling around and a bit of mental re-organization to get the hang of it. But rather than just having an outline and building one chapter after another, I find I’ve been constructing a framework and then working on individual scenes scattered through different chapters. By the time I finish with St. Cybi’s Well I’ll really understand how to use these tools efficiently, and hopefully that will mean more books, sooner, after this one. We’ll see. I hope to have some solid things to share in a month or so. But in the meantime, I would invite you to browse my 2003 and 2006 travelogues of trips to Wales. You’ll get a pretty good glimpse into the locations and descriptive language for St. Cybi’s Well, since I am basing a lot of the book on those very real experiences. Consider it something of a sneak preview, just because you read the blog. And thanks for that, by the way. It’s good to know I’m not just talking to myself here. As noted in the various science stories, 2012 DA14 is about 150 feet in diameter, and would have about the same effect were it to hit the Earth as Meteor Crater, depending on the exact composition, speed and angle of approach of the meteor. If you want to play with the variables, here’s a simulator I’ve had fun playing with in the past Impact: Earth! For the foreseeable future, then, Earth will continue to reside in a cosmic shooting gallery with an enormous number of currently unknown objects, some of which may have a direct bead on us without our knowing. While it is probably much more unlikely than likely, a potentially disastrous collision with an asteroid of at least the dimensions comparable to DA14 could occur anytime possibly with little or no warning in our lifetimes. Keep your fingers crossed that our luck — and our atmospheric ‘shields’ — continue to hold until we no longer have all of our eggs in this particular basket. But wouldn’t (The World Series) be confusing? A couple weeks ago, when I was setting up the price change and promotional stuff for the one-year anniversary of Communion of Dreams, I was again confronted with something I had pondered and then ignored previously: was this book part of a “series”? A series is a connected set of books. If this book is part of a series, identify where the book exists in the sequence with a volume number. We only accept volume numbers in numerical format (“1”, “2”, or “3”). Magazines and journals are also often grouped as a series. Identifying the series helps customers find other books in the series. Having such a series is a long and well-established literary tradition, particularly in genre fiction. Sometimes an author sets out to construct a series, sometimes a series is identified after the fact. Some authors are only known for a given series, others have several. I think Isaac Asimov is credited with like 47 separate but inter-related series, an all-time record. Well, OK, it doesn’t really. But it does make me wonder. What would I call the series for the slightly-altered-universe in which Communion of Dreams exists? 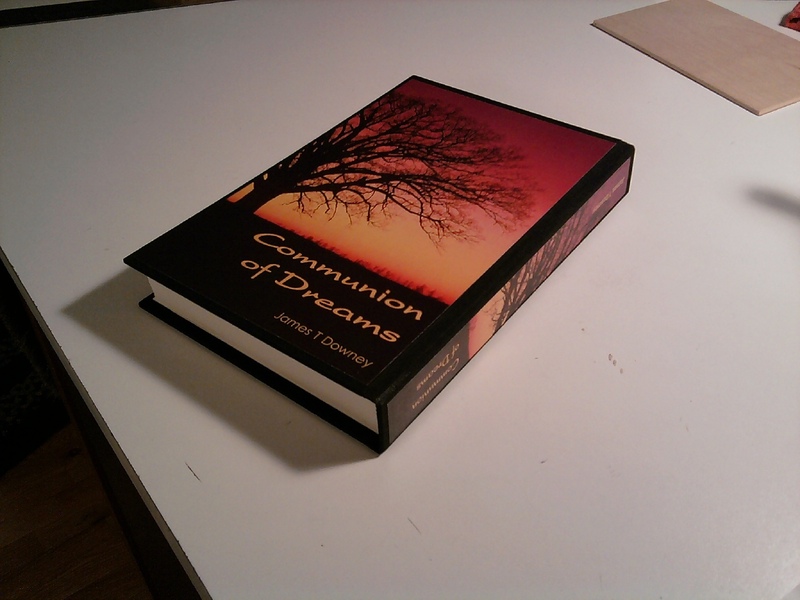 When I first published Communion of Dreams, I thought that I would eventually like to write several other related books, but I didn’t know for sure whether I would ever get around to doing so. I mean, we make plans, and have hopes & dreams and all that, but it seemed both a little presumptuous as well as potentially risky (in the “tempting fate” sort of way) to claim that I was going to write a series of books before seeing what the response to the first one was. And then there’s the complicating fact that at least for the time being I consider Communion of Dreams to be the end of any such series. St. Cybi’s Well is a prequel — the start of the so-called series, in fact. And I have some rough ideas for other books which would be related to the overall story arc, about one per decade of the time between now and the setting of Communion (2052). But those are just approximations. How can I number the books in the series when I have little confidence in how many there will be? And wouldn’t it be confusing to number the books in the order they are written, since they jump around in chronological sequence? Anyway, this is all by way of saying that I could use some help and suggestions with this. If you’ve read Communion of Dreams, you have some sense of the overall arc of the series, at least as the history is outlined in that book. And I’ve chatted a fair amount about St. Cybi’s Well. Knowing those things, what do *you* think would be a good ‘series name’ for these books? I’m serious — I’d like suggestions. Post it here in a comment, drop me an email, say something over on the FB page. If I use your suggestion, I’ll credit you with it and send you a hand-bound copy of either Communion of Dreams or St. Cybi’s Well depending on your preference (and if you’ve already got those coming as part of the Kickstarter rewards or something, we’ll work out an equitable substitute). Of late, as I have been slowly getting over the rather nasty bout of parainfluenza I mentioned previously, shedding the more annoying and disgusting symptoms, I’ve also come to realize that just now I am pulling out of the depressive trough of one of my long-term bipolar cycles. It wasn’t a particularly bad trough, and was somewhat mitigated by the success of the Kickstarter back in the fall. Nonetheless, it was there, as I can see in hindsight. I am frequently struck just how much of our life doesn’t make sense until seen from a distance. Just recently I was surprised at the revelation of *why* the failure of Her Final Year to be more successful bothered me as much as it did: it was because I had seen the book as being a way to create something positive (for the world) out of the experience of being a long-term care provider. To have the book only reach a limited audience was, in my mind, saying that our roles as care-givers didn’t matter. There is, it seems, no mechanism in the mind or the brain for ensuring the truth, or at least the veridical character, of our recollections. We have no direct access to historical truth, and what we feel or assert to be true (as Helen Keller was in a very good position to note) depends as much on our imagination as our senses. There is no way by which the events of the world can be directly transmitted or recorded in our brains; they are experienced and constructed in a highly subjective way, which is different in every individual to begin with, and differently reinterpreted or reexperienced whenever they are recollected. (The neuroscientist Gerald M. Edelman often speaks of perceiving as “creating,” and remembering as “recreating” or “recategorizing.”) Frequently, our only truth is narrative truth, the stories we tell each other, and ourselves—the stories we continually recategorize and refine. Such subjectivity is built into the very nature of memory, and follows from its basis and mechanisms in the human brain. The wonder is that aberrations of a gross sort are relatively rare, and that, for the most part, our memories are relatively solid and reliable. I think this is at the very heart of why fiction has such power, and appeal. I also think that it explains the well-documented phenomenon of people believing things which are clearly and demonstratively false, if their facts come from a trusted source. In other words, that reality is a shared construct. A Communion of Dreams, if you will.